Dollar General and Dollar Tree are facing a number of headwinds heading into next year. 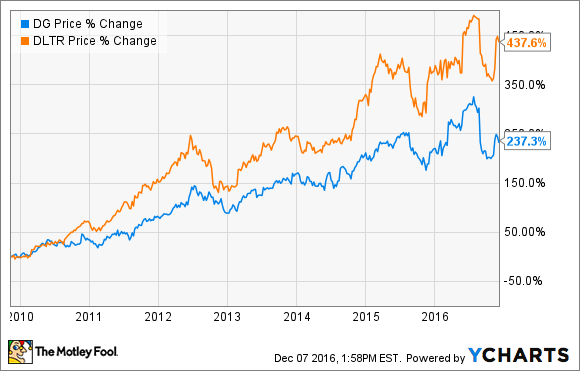 Dollar store chains Dollar Tree (NASDAQ:DLTR) and Dollar General (NYSE:DG) have been big winners since the recession, as the chart below shows. Despite grossing more than $40 billion in combined annual revenue, Dollar General and Dollar Tree aren't each other's biggest rivals. The 800-pound gorilla in the low-priced retail room is Wal-Mart (NYSE:WMT), with more than $300 billion in domestic sales.